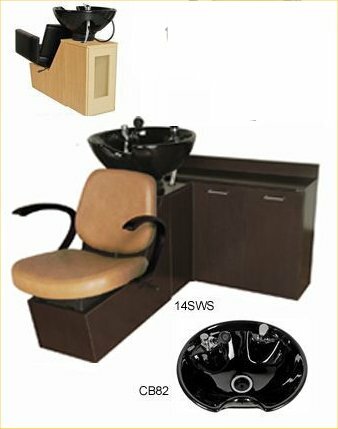 14SWS Massey SIDEWASH Shuttle Shampoo w/CB82 porcelain bowl w/ 6" tilt-range, pivoting lumbar-support back-cushion, adjustable lock-in-place seat w/ 6" travel. Additionally includes 48"W x 12"D x 24"H back-bar w/ clean towel storage, soiled towel bin, wide ledge for shampoos-conditioners. 14AOS Massey ADD-ON Shuttle Shampoo w/ CB82 porcelain bowl w/ 6" tilt-range, pivoting lumbar-support back, adjustable-locking seat w/ 6" travel, side access door. Designed for installation against traditional sidewash shampoo bulkheads. Tilting Porcelain Bowls include 570 faucet, 388 vacuum breaker, spray hose, strainer assembly, flexible tailstock, and durable tilt-mechanism.